Over the last weeks we have been looking at the reminders of God all around in the symbolism of our church building and stained glass windows. Today we come to window number 6 in memory of Elizabeth Tannehill. Marie Elizabeth Sellinger Tannehill was Born Jan 3 1859 DEATH Jan 4 1891 (aged 32) BURIAL Jerusalem Cemetery on Hwy 84 west of Winnfield. She was married to Richard Lafayette Tannehill who was said to be a large man (over 6 foot 4 inches) and was a farmer, timberman and politician north of Winnfield. The Winn Parish history book reports that Richard was the Sheriff of Winn Parish from 1874 to 1884. In 1892, he ran for Governor of Louisiana on the Populist ticket and won Winn Parish with 1,001 votes. He was the first elected mayor of Winnfield in 1898. Elizabeth and Richard had 8 children: George Milton Tannehill 1877–1940, Herbert N Tannehill 1879–1961, Clarence Eugene Tannehill 1881–1963, Richard Lafayette Tannehill 1884–1929, Ena Tannehill 1886–1895, Lena Tannehill Pace 1886–1976, Elizabeth Tannehill Walsh 1888–1977, Ella May Tannehill Hardtner 1890–1980. Their 7th child, Elizabeth Tannehill Walsh, often called Bessie, was Don Walsh’s grandmother. The only known relatives of Elizabeth Tannehill active in our church is Don’s widow, Shirley Walsh. [i] After Marie Elizabeth died, Richard Tannehill remarried Lula Dee Long and they had ten more children. [ii] Richard and Lula are buried together in Winnfield City Cemetery. While we don’t have any church records from that era, I’m told that Elizabeth was a member of the Methodist Church. We are unsure if Richard was a member of the Methodist Church. As I was doing my research I wondered why Elizabeth was buried west of town while Lula and Richard are buried in the Winnfield Cemetery. Donovan Hearne Walsh writes this on genealogy.com. “Richard Lafayette’s parents (David & Nancy) came to Winn Parish with them. Three sons died at Tannehill, as did Nancy, and were buried there. Later, the cemetery was moved to Jerusalem Cemetery at the request of the area’s first railroad (Arkansas railroad, later Rock Island RR). At that time period the public wanted railroad transport desperately and accommodated their wishes. These graves were put in one grave marked “Grandmother.” A Nancy M. T. marker was added later. R. L. Tannehill made this move and his remaining brother, Louis Monroe T., objected causing a large disagreement. :.M.T. is buried at Winnfield Cemetery, as is R.L.T. -Donovan Hearne Walsh[iii]. The move of this cemetery for the railroad explains why Elizabeth is buried west of Winnfield. The Tannehill’s have left us a rich history of service to God, state, and community as well as a wonderful gift in this beautiful window. Jesus said, “I am the bread of life.” Heads of wheat symbolize bread, and the Holy Communion. Also the wheat represents the good crop, the faithful, and the tares are the weeds, the wicked. (Matt. 13). Perhaps more than any other grain, wheat has established a reputation as both a culinary staple and a cultural symbol. It has been cultivated since the very beginning of human history, and today is one of the most widely grown crops on earth. In the ancient world, wheat was a symbol of abundance, life, and fertility. Wheat has also served as an emblem for deities associated with these notions, such as the Roman goddess of agriculture, Ceres, gives us the word “cereal”, which in its original usage referred to grains. In Matthew 13:24-30, we find a parable of Jesus explaining the kingdom of God. In this parable Jesus is calling into question the customary practice of pulling tares, or weeds, out of a crop. [v] In this parable, wheat represents believers instead of the “weeds” or “tares”, which represent unbelievers. Wheat may also be used to represent the bread in Holy Communion and, further, the Body of Christ. Then in John 6:48 Jesus says I am the bread of life. 49 Your forefathers ate the manna in the desert, yet they died. 50 But here is the bread that comes down from heaven, which a man may eat and not die. 51 I am the living bread that came down from heaven. If anyone eats of this bread, he will live forever. This bread is my flesh, which I will give for the life of the world.” (NIV)[vi] The wheat reminds us of Jesus’ parables, rebirth, resurrection, and the bread of life Jesus Christ. The Christmas Rose represents the Nativity of our Lord. Deep significance is derived from its survival through the centuries’ in spite of snow and storms. It blooms just at Christmas time. The Christmas rose, Helleborus niger, is, ironically, not even a rose but a member of the buttercup family. It gets the common name, Christmas rose from its resemblance to wild roses with its large flat flowers on short stems, it produces white and occasionally pink flowers standing around 9-12 inches in height. Its natural habitat can be found up in the mountainous regions of Switzerland, Bavarian Germany, Austria, Northern Italy and Croatia but can grow in any well drained garden soil and is hardy even in the most shaded of areas. It is a true Christmas plant as it flowers in the depths of winters to early spring but don’t pick it as it is highly poisonous and even touching it can cause skin irritations. The Calvary Cross with the steps of Faith, Hope and Charity is also called the graded cross. The anchor at the left is a symbol of hope “sure and steadfast” (Heb. 6:19). The Bible is again pictured with the Cross. Two other books in the Protestant church call sacred associations to mind—the hymnal and The Book of Worship. We spent quite a bit of time discussing the symbolism of Faith, hope and love, 2 weeks ago in the Wren window. So I will hit the high points and focus on what is different in this window. The anchor represents Hope. It was a relevant popular symbol at a time when seafaring meant that a loved one may never be seen again. At a time when danger was typical for travel, the anchor represented hope for home in this life and in the life to come. Charity is often represented by the heart, though in our window it is symbolized by an open Bible. Charity is a derivative of ἀγάπη (agapē), the word used by the English translation of the Bible in the 16th century. Charity represents the idea the believers should strive to love God and to love others as God loves them. Charity symbolizes the desire to love everyone, including one’s enemies, neighbors and the poor. Charity cannot be achieved without faith and hope because charity is love for all. [xiii] Faith, hope, and charity go together to teach us about our faith and the way that we should live. We love our stained glass windows and we should. But what do people see in us? Does the light of Christ shine through? Wheat reminds us of Jesus’ parables, rebirth, resurrection, and the bread of life Jesus Christ. The Christmas Rose reminds us of the gift of Jesus at Christmas and the legend of a little shepherd girl’s gift to the newborn king. 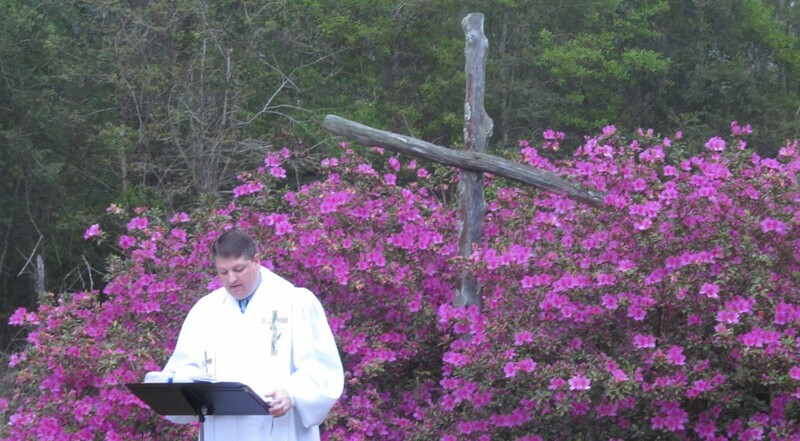 The graded cross of faith, hope, and charity go together to teach us about our faith and the way that we should live. The Elizabeth Tannehill window reminds us of her faith and generosity. The question is will we allow the light of God to shine through us as brightly as it does these windows? The entire community mourns the passing of Andrew Jackson Gwin, for twenty one years one of the foremost enterprising citizens of Winnfield, died on January 31, 1927 at his home on Main Street. Though Mr. Gwin had been suffering with heart trouble for more than a year, he had not been critically ill for more than thirty days and his death Monday morning while not unexpected was a distinct shock to the entire town because of the high esteem in which he is held. J. Gwin was a native of Tennessee, being born there July 10, 1856. Soon after his birth his parents came to Louisiana and located at Rayville, where Mr. Gwin was reared, receiving his education in the schools of Richland Parish. In 1881, A. J. Gwin was married to Miss Augusta McNeill and to this union four children were born, three of whom are now living. In the year 1885, Mr. Gwin with his family left Richland Parish and located for a short time in Ruston, moving from there to Gibsland where he remained until 1887, he then went to Minden where he was engaged in the contracting business for something like fifteen years. He came to Winnfield in 1903, continuing his business as a contractor until 1905, when he established the Winnfield Brick Factory and began the manufacture and sale of brick. From that time on being the only enterprise of its kind in town and the first after a period of many years. In March, 1909, Mrs. Augusta Gwin died and in 1911, Mr. Gwin was married to Miss Florence Humble of Mississippi, who with his three children, J. M. Gwin and Mrs. Mack L. Branch, of Winnfield, and D. J. Gwin, of Union Springs, Alabama, survive him. The torch refers to youth’s relation to the past and its obligation to bear the light of truth through the current age to the coming age. “The Lord Is My Light and My Salvation, Whom shall 1 fear?” Psalms 27:1. Jesus said, “I am the light of the world; he who follows me will not walk in darkness, but will have the light of life.” John 8:12. Most of us when we see a torch we think of the iconic Olympic torch. We had the privilege to see the stadium and venues of the 1992 Olympic games in Barcelona, Spain last summer. The Olympic flame’s origins lie in ancient Greece, where a fire was kept burning throughout the celebration of the ancient Olympics. Today, the Olympic torch is lit in Greece and then relayed by “Torchbearers” to the various designated sites of the games. These torchbearers are usually famous people or celebrities whom the country is proud to show off. Torchbearers are people that others would want to emulate, they are role models. It is a great honour to be chosen to carry the Olympic Torch. As Christians, we are called to be Torchbearers for Christ! A torchbearer is a person who leads the way with the light that he carries. Jesus is the light of the world and since He dwells in us, we are to carry Him wherever we go. We are to let Him shine so that those who do not know Him may come to know Him. The Bible says “This then is the message which we have heard of him, and declare unto you, that God is light, and in him is no darkness at all” (1 John 1:5). “That you may be blameless and innocent, children of God without blemish in the midst of a crooked and perverse generation, among whom you shine as lights in the world” (Phil 2:15). After the resurrection, Jesus met with the eleven disciples and said to them “Go ye into all the world and preach the gospel to every creature” (Mark 16:15). This great commission was not only for the disciples but for all of us who would confess Jesus as Lord and Saviour. We have a mandate to go and preach the Gospel, of Jesus Christ to every nation of the world. We should be proud carriers of the torch. During the Olympic Games, we make time to attend or watch the games on TV. As Christian torchbearers, we need to make evangelization a part of our lives, because we are also called to pass on the torch. It is imperative that we Christians pass on the torch from generation to generation. It is the duty of parents, Christian teachers, priests, bishops, prayer group members, missionaries and all who call themselves Christians to ensure that the torch is passed on. [ii] The torch reminds us of people who have passed on their faith to us and our call to pass it on to others, just as we sang earlier in the service. The font is pictured again with the dove of the Holy Spirit lending emphasis to our belief in the two sacraments: Holy Communion and Baptism. Jesus also told his followers to be “innocent as doves” (Matt. 10:16). We have already spoken extensively about the symbolism of the baptismal font and the dove, so this morning I will focus on the Sacraments, which sacraments we observe, what they are, and what they mean. The United Methodist Church recognizes two sacraments in which Christ himself participated: baptism and the Lord’s Supper. Baptism marks the beginning of our lifelong journey as disciples of Jesus Christ. Through baptism, we are joined with the Triune God, the whole of Christ’s church, and our local congregation. The water and the work of the Holy Spirit in baptism convey God’s saving grace, the forgiveness of our sins, and new life in Jesus Christ. Persons of any age may be baptized—infants, children, youth, and adults. United Methodists baptize in a variety of ways—immersion, pouring, or sprinkling, though sprinkling is probably most common. A person receives the sacrament of baptism only once in his or her life. The Lord’s Supper (also called Holy Communion, Eucharist) nourishes and sustains us in our journey as disciples of Jesus Christ. As we pray together and receive the body and blood of Christ together, we are united with Christ, with one another, and in ministry to all the world. All who love Christ, earnestly repent of their sin and seek to live in peace with one another are invited to join us in offering our prayer of thanksgiving and receive the body and blood of Christ—regardless of age or church membership. Congregations serve the elements of the Lord’s Supper several ways, but always include both bread and cup. The Lord’s Supper is to be celebrated and received regularly—John Wesley said, “as often as [one] can.”[iii] United Methodists observe 2 sacraments. Roman Catholics believe there are nine. Other denominations see them only as ordinances, reminders of what Jesus did and taught. How grace “works” through the sacraments is a subject upon which the Wesleys – John and Charles – chose not to speculate and neither have subsequent United Methodist teachings, an indicator of trust in God’s promises. God in Jesus Christ knew that we needed to touch, feel, taste, see and hear God, and thus, God invites us into an experience through the sacraments. Grace transforms us. How, exactly, is a mystery. [iv] The sacraments remind us of what God has done and is doing in our lives. The accessibility to the Bible since the days of the Reformation leads to its being shown open. The Lamp of Learning recalls the scripture, “Thy word is a lamp to my feet and a light to my path.” (Psalms 119:105). To the ancients a lamp was not merely a light for darkness, but also a symbol of intelligence and learning. Today it means wisdom and knowledge. That a lamp denotes faith, also the intelligence of truth and wisdom of good, which are from the Lord alone. [v] The lamp is often used in connection with the tabernacle and the temple (Exodus 25:37; 2 Chronicles 4:20), where oil was employed for light (Exodus 35:14; Leviticus 24:2). Lamps were in use for thousands of years. Niches for lamps are found in the tombs of Tell el-Amarna in Egypt. We saw similar niches in the wall when we visited the Roman catacombs. Clay lamps were used in Canaan by the Amorites before the Israelites took possession. The excavations in Palestine have furnished thousands of specimens, and have enabled us to trace the development from about 2000 BC onward. “Lamp” is used in the sense of a guide in Psalms 119:105; Proverbs 6:23, and for the spirit, which is called the lamp of God in man (Proverbs 20:27), and it of course often signifies the light itself. What does the lamp illuminate? In our window, it illuminates the scripture. Not that the Bible in our window is open. A closed Bible is only an ornament and is more like a paper weight than the Word of God. An open Bible is one that is read and used on a regular basis. Thankfully, there are millions of Bibles available today. According to the latest Scripture Language Report produced each year by the American Bible Society, some part of the Bible has been translated and published in 2,527 of the world’s languages (469 of these have a whole Bible, and a further 1,231 have a complete New Testament). If we take the total number of languages in the world to be approximately 6,900– the figure varies in different sources, largely because it is not always clear what constitutes a language as opposed to a dialect – this means that there are roughly 4,400 languages which have no part of the Bible. According to statistics from Wycliffe International, the Society of Gideons, and the International Bible Society, the number of new Bibles that are sold, given away, or otherwise distributed in the United States is about 168,000 per day. [vii] The light and the open Bible is our guide for life and available across the world. We love our stained glass windows and we should. But what do people see in us? Does the light of Christ shine through? The torch reminds us of those who passed faith on to us and our call to pass the faith on to others. The baptismal font with the dove reminds us of the sacraments- outward signs of an inward faith- and that God acts in our lives through them. The light with the Bible reminds us that the Bible is our guide for life and is available across the world. The Gwin window reminds us of his faith and generosity. The question is will we allow the light of God to shine through us as brightly as it does these windows? Today we will focus on Window Number four in honor of Dr. and Mrs F.C. Wren. Funeral services for Dr. Floyd Carr Wren, prominent retired dentist and civic leader, were held at 3 p.m. Friday, February 10, 1967 in the First Methodist Church of Winnfield with the Rev. Richard Walton, pastor, officiating. He was assisted by Rev. Fred Flurry, Sr., and the Rev. R. H. Staples, former pastors. Dr. Wren died at 12:20 p.m. Thursday, February 9, 1967, in a Winnfield hospital following an apparent heart attack. He was 87. A native of Webster Parish, Dr. Wren received his degree in dentistry from Vanderbilt University, and first located in Jonesboro, where he served as Mayor while also practicing dentistry. He came to Winnfield in 1916 when he became a part of the religious and civic life in the community being active until the time of his death. He practiced dentistry until his retirement in 1945. At one time during his career he experienced an arthritic condition and operated a Winnfield dairy until his recovery. Funeral services for Mrs. Leta O. Wren, 87, of Winnfield, were held at 3:30 p.m. Friday, June 5, 1970 at the First Methodist Church of Winnfield with Rev. J. C. Skinner and Rev. Robert Gage officiating. Mrs Wren died at 11:15 a.m. Thursday, June 4, 1970, in a Winnfield hospital. She was a native of Caldwell, Ark., but lived in Tennessee during the early years of her life. Dr. and Mrs. Wren were survived by; a daughter, Mrs. Thomas H. (Margaret) Harrel, Sr. of Winnfield, and two grandsons, Thomas Harrel, Jr., and George Harrel, all of Winnfield. They were preceded in death by a son, Floyd C Wren Jr, who died in a fire in August of 1953. The Wren’s were pillars of the church and were often relied on by the pastors. Dr. Wren was a fine Christian man who rarely uttered a cross word and actively gave out tracks to talk to others about faith. Their grandson, Tommy, described Dr. Wren as one of the greatest men he has ever known and is still his hero to this day. The Dr. Wren Sunday School classes was started and named after him in his memory. Dr. Wren wrote much of the original history of the church that I am using as a source for this series. The Wren’s and their family have passed a great tradition of faithfulness to us, as well as a wonderful gift in their beautiful window. The lion, as king of beasts, represents the royal character of Christ and refers to the opening verses of the Gospel in his reference to John the Baptist, “The voice of one crying in the wilderness . . .” The halo of light, the nimbus, behind the head denotes sanctity. Who was St Mark? While we are not certain, most scholars believe St. Mark the Evangelist was most likely a Hebrew and likely a priest of the tribe of Levi (as St Bede the Venerable teaches). Most scholars believe that St Mark did not know Christ during his earthly life but was converted to the faith by St Peter some time in the first years after Pentecost. This is the most natural read of Scripture, when St Peter testifies that St Mark is his spiritual son (“Mark, my son”, 1 Peter 5:13). He accompanied Peter to many places, even to Rome. Later, he was sent by St Peter to preach the Gospel in Egypt and was Bishop of the Church in Alexandria. Here he gave witness to Christ through martyrdom. Why is St Mark pictured as a lion? The oldest and the shortest of the four Gospels, the Gospel of Mark emphasizes Jesus’s rejection by humanity while being God’s triumphant envoy. Probably written for gentile converts in Rome—after the death of Peter and Paul sometime between A.D. 60 and 70—Mark’s Gospel is the gradual manifestation of a “scandal”: a crucified Messiah. [v] The lion of Mark is the roar to repentance by John the Baptist and throughout his gospel. Faith, Hop e, and Charity are referred to by Paul in I Cor. 13:13- “And now abideth faith, hope, charity, these three; but the greatest of these is charity.”KJV Faith is belief and trust in the triune God; Hope signifies our promise of eternal life and triumph of truth and justice; Charity, or love, is the center of our religion as taught by Jesus in many ways. The anchor represents Hope. It was a relevant popular symbol at a time when seafaring meant that a loved one may never be seen again. The anchor to moor the ship gives solace and comfort to the wayward ship, as it finds a home. Hope is fundamental to the principals of what it is to believe in a better future. At a time when danger was typical for travel, the anchor represented hope for home in this life and in the life to come. Charity is often represented by the heart, though in our window it is symbolized by an open Bible. Charity is a derivative of ἀγάπη (agapē), the word used by the English translation of the Bible in the 16th century. It was only in the Challoner Douay Rheims Bible of 1752 and the King James Version of 1611 that the term ‘charity’ was used for the similar ideal of Christian love. Today, many modern translations use the word “love” instead of charity. Charity represents the idea the believers should strive to love God and to love others as God loves them. Charity symbolizes the desire to love everyone, including one’s enemies, neighbors and the poor. The three symbols are bound by charity. Charity cannot be achieved without faith and hope because charity is love for all. [vii] Faith, hope, and charity go together to teach us about our faith and the way that we should live. Matthew traced the human lineage of Jesus; therefore, the symbol used for him is a winged man. He emphasized the humanity of Christ. Here again is the nimbus of sanctity. Matthew, meaning gift of God, was a common Jewish name after the Exile. He was the son of Alphaeus, and was a publican or tax-gatherer at Capernaum. On one occasion Jesus, coming up from the side of the lake, passed the custom-house where Matthew was seated, and said to him, “Follow me.” Matthew arose and followed him, and became his disciple (Matt. 9:9). Formerly the name by which he was known was Levi (Mark 2:14; Luke 5:27); he now changed it, possibly in grateful memory of his call, to Matthew. The same day on which Jesus called him he made a “great feast” (Luke 5:29), a farewell feast, to which he invited Jesus and his disciples, and probably also many of old associates. He was afterwards selected as one of the twelve (6:15). His name does not occur again in the Gospel history except in the lists of the apostles. The last notice of him is in Acts 1:13. Although traditionally regarded as the author of the Gospel According to Saint Matthew, modern scholarship questions this attribution. Matthew’s symbol as an evangelist is a man, and in art he is often depicted with sword and money bag. What happened to Matthew after Jesus’ resurrection and ascension we have only legend. St. Irenæus tells us that Matthew preached the Gospel among the Hebrews, St. Clement of Alexandria claiming that he did this for fifteen years, and Eusebius maintains that, before going into other countries, he gave them his Gospel in the mother tongue. Ancient writers are not consistent as to the countries evangelized by Matthew, but almost all mention Ethiopia to the south of the Caspian Sea (not Ethiopia in Africa), and some Persia and the kingdom of the Parthians, Macedonia, and Syria. There is a disagreement as to the place of St. Matthew’s martyrdom and the kind of torture inflicted on him, therefore it is not known whether he was burned, stoned, or beheaded. His Gospel was probably first written in Aramaic and later translated into Greek. Since Matthew was a Jew, he wrote with other Jews in mind. His gospel spends much time discussing the Old Testament prophecies and pointing out how Jesus fulfilled them. Mathew’s gospel contains more than 130 Old Testament quotes and allusions[ix]. The man of St.Matthew reminds us of Jesus’ humanity and fulfillment of Old Testament prophecies about the Messiah. We love our stained glass windows and we should. But this song from Johnny Cash reminds us that they are not the most important things. God Ain’t No Stained Glass Window God never keeps His window closed. What about us? Do we keep our window closed or allow the light of Christ shine through? The lion of St. Mark reminds us of his roar to repentance by John the Baptist. Faith, hope, and charity are central themes to our faith from 1 Corinthians 13. The man of St. Matthew reminds us of the humanity of Jesus through his grand genealogy and fulfillment of scripture. I close with this editorial by George Larson, editor of the Winn Parish Enterprise. “Dr. F.C. Wren is gone from this earth but the memory and influence of this rare man will live long in this community and wherever his life touched other people. He lived unselfishly and fully, holding fast to high principles in every endeavor he undertook. He was a true Christian, a ‘prince of a man and a great man’ as Rev. Richard Walton of the First Methodist Church described him. Dr. Wren’s kindness to all men was one of his outstanding traits. Always interested in his community and its progress, he never ceased to talk and write about its good points and its future possibilities. He had the courage to speak up for what he believed, whether it concerned a political question, a local bond proposal, or some other controversial issue. Dr. Wren’s life really centered around his church, to which he gave a lifetime of service in nearly every capacity a layman could fill. Living, working, and serving were joyful to him. He was a participant and not just a spectator. He remained young at heart. He died as he wished it- being useful and active until the last days of his 87 years. His passing leaves a void, but his life will always be an inspiration to those who knew him. Dr. Wren was a great and good man.” The Wren window reminds us of their faith and generosity. The question is will we allow the light of God to shine through us as brightly as it does these windows? Today we will focus on Window Number three in memory of Mr. and Mrs. J.J. Dickerson. John Joseph “J. J.” Dickerson was born October 6, 1824 in North Carolina and died August 9, 1913 at the age of 88 in Winnfield. He is buried in the Winnfield Cemetery. Because of the age, I was unable to find an obituary for Mr. Dickerson but his wife’s obituary also tells us about him. His wife, Mary Margaret Jackson Dickerson died at 8 a.m. Tuesday, May 19, 1925, age 90 years. Mrs. Dickerson was born in Tennessee February 25th, 1835, moved in early childhood with her parents to Spanish Lake, Natchitoches Parish, where they lived until they moved to Winn Parish, La., in 1859. On February 5th, 1861, she was married to John J. Dickerson, who soon after the marriage enlisted in the Confederate States Army and served faithfully and loyally during the four years of the Civil War. Mrs. Dickerson joined the Methodist Episcopal Church South at the age of nine years and gave eighty years of her life in service to Christ and His church. Those who knew her well know that hers was not a profession without possession, for every day of her life was a testimonial that the spirit of Christ filled her soul being daily reflected in her Christian living. The Dickerson home always had a preacher’s room in it where the preachers were received and entertained, such godly men as John Hearn, John F. Wynn, Eddie and Albert Galloway, Dan C. Barr, and others down through the years. Hers was a consecrated, Christian life, opposed to sinful worldliness, in dress, in speech, in manners or any form, always striving to influence those with whom she was associated to lives of simplicity and holiness. After funeral services at the Methodist Church conducted by her pastor, Rev. P. M. Caraway, assisted by the Presiding Elder Rev. K. W. Dodson, and a former pastor and special friend, Rev. Dan C. Barr, of Oak Ridge, La., her remains were buried in the Winnfield Cemetery amidst a host of grief stricken relatives and friends. The abundant and beautiful floral offerings attested the high esteem in which she was held in the community. The Dickerson’s were survived by their children: Mrs. H. L. Brian of Verda, La., Mrs. G. M. Wyatt of Couley, La., M. M. Dickerson, Mrs. J. R. Hall, Mrs. B. W. Bailey, and William F. Dickerson, of Winnfield, La. Published in The Winn Parish Enterprise (Winnfield, LA), May 21, 1925. The Dickerson’s and their family have passed a great tradition of faithfulness to us, as well as a wonderful gift in their beautiful window. The dove with the olive branch depicts peace, victory, and the expectation of new life. This symbol comes from the account of the cessation of the flood recorded in Genesis 8:11 (Noah sent out the dove to see whether the flood was receding. When the dove returned with a “freshly plucked olive leaf” in her beak, Noah knew that the waters were receding). Hence the olive branch may be said to symbolize deliverance from the hardships of life and a peaceful life with God in the world to come. The dove and olive branch is one of the most ancient symbols of peace. We looked at the dove a few weeks ago in the Hyde window, so this morning, I will focus on the symbolism of the olive branch. The olive branch symbolizes deliverance from the hardships of life and a peaceful life with God in the world to come. The olive tree was so important that the reward for winning an event in the ancient Olympic Games was not a gold medal, but a wreath of olive leaves with which the winner was crowned. The olive also appears in many ancient texts in relation with peace. In Virgil’s Aeneid, for instance, the main character holds an olive branch to offer peace, and in other texts there are records of Roman generals holding up an olive branch to ask for peace after being defeated in battle. Extending an olive branch meant the ending of hostilities between two parties and signaled the end of the conflict. The United Nations flag contains an olive branch for this very purpose; to end all hostilities between waring nations. It’s also found on many of the nation’s symbols, like in the 1885 Great Seal of the United States. In an olive grove, called The Garden of Gethsemane, Jesus was betrayed by Judas Iscariot. The name Gethsemane means “olive press” and there Jesus had all the world’s sin all pressing down upon Him, as if to crush Him. Here it was that Jesus, “being in an agony he prayed more earnestly; and his sweat became like great drops of blood falling down to the ground” (Luke 22:44). It’s as if the olive press was squeezing Jesus by the weight of all of the sins of humanity that have ever been committed and will yet be committed. Olive oils are extracted from olives when they are pressed and Jesus was hard pressed in a garden of olives which are pressed or crushed to produce oil. In this same way, Jesus “was pierced for our transgressions; he was crushed for our iniquities” (Isaiah 53:5). The dove and olive branch remind us of peace, victory and new life. What is the meaning of the cross? Simply put, the meaning of the cross is death. From about the 6th century BC until the 4th century AD, the cross was an instrument of execution that resulted in death by the most torturous and painful of ways. In crucifixion a person was either tied or nailed to a wooden cross and left to hang until dead. Death would be slow and excruciatingly painful; in fact, the word excruciating literally means “out of crucifying.” Using the cross as a symbol of Jesus is like using a gun to symbolize John F. Kennedy. The cross was the instrument of Jesus’ death, yet it is the nearly universal symbol of Christianity. Why did Jesus have to die? To redeem us. In Genesis, God created a perfect heavens and earth, yet because of sin, our relationship with God was broken and marred. God the Father sent Jesus to take on human flesh and to be the Savior of His people. Born of a virgin, Jesus avoided the curse of the fall that infects all other human beings. As the sinless Son of God, He could provide the unblemished sacrifice that God requires. God’s justice demanded judgment and punishment for sin; God’s love moved Him to send His one and only Son to be the sacrifice for sin. The Easter Lily is the traditional flower of Easter and is highly regarded as a joyful symbol of elegance, beauty, spirituality, hope, and life. The lily has come to symbolize the resurrection of Jesus because of its delicacy of form and its snow white color. The popular Easter lily we use today to celebrate the holiday is referred to as ‘the white-robed apostles of hope. [iii] Their color symbolizes the purity of Christ, who was free from sin. In many paintings, the angel Gabriel is depicted as handing Mary white lilies, which symbolizes her purity as well. The trumpet shape of the Easter lily represents a trumpet sounding the message that Jesus has risen, and the nature in which lilies grow is symbolic of the resurrection as well. From ugly bulbs that are underground for three years or longer, they become beautiful flowers. This process is reminiscent of Jesus’s brutal death and holy resurrection. Thus, lilies represent rebirth and hope, just as the resurrection does in the Christian faith. Although Easter lilies are symbols of new life and purity, their history of getting to America is actually rooted in war. Following World War I, soldier Louis Houghton brought a suitcase of lily bulbs from Japan back to the U.S., specifically to his home state of Oregon. Houghton gave the lily bulbs to his horticultural friends, and soon enough, the area along the California-Oregon border, which happened to have prime growing conditions for the flowers, became known as the Easter Lily Capital of the World. After Pearl Harbor, Japanese shipment of Easter lilies was cut off, which brought high demand to the Oregon and California growers, giving the flowers yet another nickname—White Gold. Oregon and California now produce the majority of the world’s Easter lilies, although there are only about 10 growers left. Easter lilies are difficult to grow, and the process to the final product is a long, precise one. The bulbs have to be cultivated in fields for at least three years, during which they require care, moving, and tending as they progress through growth stages. Once the bulbs are ready to be shipped, they’re placed under strict temperature restrictions to ensure they bloom on time for Easter, which can be a gamble, considering Easter doesn’t fall on the same day each year. So when you pick up an Easter lily at the store, keep in mind the years of work that got it to you. The following poem by Louise Lewin Matthews captures the spiritual essence of the Easter Lily: Easter morn with lilies fair Fills the church with perfumes rare, As their clouds of incense rise, Sweetest offerings to the skies. Stately lilies pure and white Flooding darkness with their light, Bloom and sorrow drifts away, On this holy hallow’d day. We love our stained glass windows and we should. But what do people see in us? Does the light of Christ shine through? The dove with the olive branch reminds us of peace, victory and new life. The Bible tells us the story of the cross, of Jesus sacrifice for us and call to take up our own cross. The Easter lily reminds us of the resurrection of Jesus following his death on the cross. The Dickerson window reminds us of their faith and generosity. The question is will we allow the light of God to shine through us as brightly as it does these windows?